A Challenging Journey Through Space! To say that Gradius is merely challenging is a gross understatement as the game will have you facing hordes of enemy ships as well as difficult bosses that will test your reaction and skills! 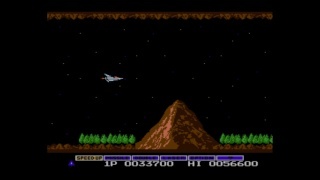 The game allows you to power-up your ship in various ways such as increasing its spead, adding a shield, and equiping new weapons which you'll quickly realize that some skills and weapons while good in some situations could be a hindrance in others. This balancing act of having to learn what power-up is best in your current situation is what truly makes Gradius challenging! The controls in the game are quite awkward when using the Gamepad, but the Wii Remote sideways method is very easy to use, with the Classic Controller Pro being a good second choice. Overall the Gamepad while not recommended isn't a horrible control method, but it will take awhile to get used to, whereas the other control methods are a breeze to use properly! 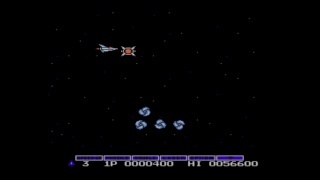 The graphics in Gradius have aged poorly and don't look all that good much like those of the original Metroid game, but it still won't turn off retro gamers who enjoy playing 8-16 bit games, the music is fairly decent and adds to the nostalgic feeling of the game, but doesn't really stand out as well as the soundtracks in other retro shooter titles. Overall the graphics and music are by far the weakest aspect of the game and do slightly hurt the game's score, but not by a huge amount. 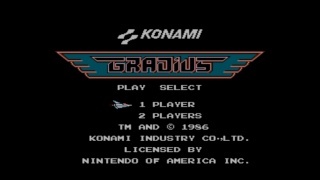 With fun, yet challenging gameplay Gradius is an enjoyable trip down memory lane, however some of the control methods are a little awkward and the graphics have not aged well which does make the game lose some points, but if you are a retro gamer and enjoy sidescrolling shooters we still recommend downloading this title! I downloaded this a long time ago on my Wii it's a good enough game. I agree with the score too so nice review. Another great review dude. You have found your "style" so your reviews are a sight better than they used to be. As for the game, yes it's fun but I agree that the game hasn't aged well. @Ragnarok wrote: Another great review dude. You have found your "style" so your reviews are a sight better than they used to be. As for the game, yes it's fun but I agree that the game hasn't aged well. I agree your reviews are so much better now! It's a shame that the superior Salamander series never became successful outside of Japan.